[In late September I was surprised and pleased to learn that this review came in first place in the 2018 North American Guild of Beer Writers awards as the Best Beer Review. Particularly after I read the fine reviews that came in second and third, and remarked how pithy they were. It may mark some kind of first where being discursive paid off. 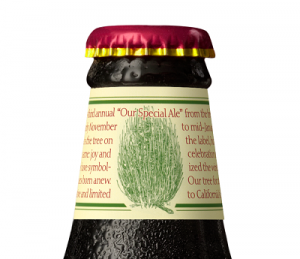 Today is Saint Lucy’s Day, which means it’s a good day to drink the 2017 version of Anchor Brewing’s Our Special Ale. The reasoning for this gets a little convoluted, so let’s start by conceding that any day you can lay hands on some is a good day to drink Anchor’s Christmas beer. What we’re starting is the sixth year of the 12 Beers of Christmas, a romp through a dozen brews keyed to the holiday or winter season. Welcome aboard to all. For those new to the game the 12 Beers of Christmas 2016 Reprise will bring you quickly up to date, with links to the 60 different choices from the past five years. The one constant has been Anchor’s Our Special Ale—still different, as it changes its recipe every year, and that now spans 43 consecutive years. Anchor’s release of its first holiday beer in 1975 revived a tradition dead in the U.S. since Prohibition. These days the corpse is running wild; last year Paste Magazine ran a blind tasting of 104 Christmas and Winter beers and gave no indication it had exhausted the supply. The tradition has been lively abroad as well, and I’ve again stocked up on a bunch of imports. But it’s always worth a tip of the cap to the San Francisco brewery. The annual appearance of the Anchor Christmas beer has become one of my traditions in any case, along with a few others that regularly usher in the season, like Sierra Nevada’s Celebration Ale and Deschutes Brewery’s Jubelale (“Warming Up for the 12 Beers of Christmas“). 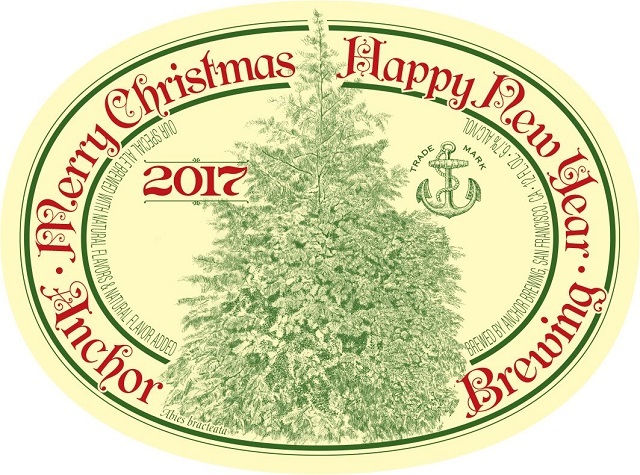 Part of the fun of the annual Anchor release is a new tree on the label design, usually a California coniferous of some sort, drawn by artist James Stitt every year (except, for some reason, 1976). Anchor makes the point that trees have long been symbols of the winter solstice, when the earth is set to be born anew in its lengthening days. Lest this seem a bit too pagan, this year’s tree is the rare Santa Lucia fir (Abies bracteata), found only in the Santa Lucia range on central California’s central coast. 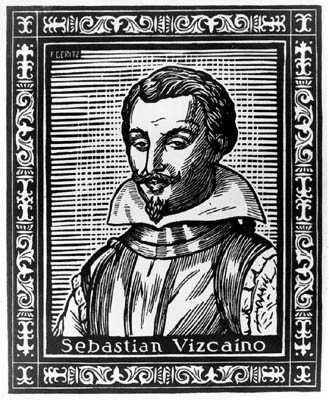 The range was named for Santa Lucia, or Saint Lucy, in 1602, by Spanish explorer Sebastian Vizcaino, who happened to be passing by on December 14, the day after Saint Lucy’s feast day. 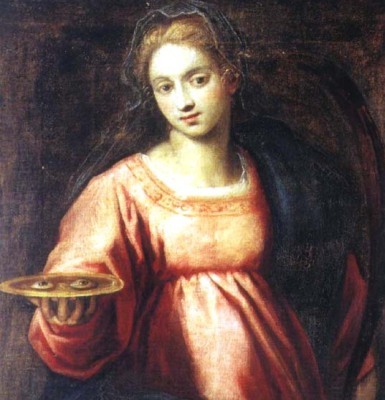 Saint Lucy was a fourth century Christian who, so that she might use both hands to deliver food to the poor, wore a wreath of candles on her head. An avowed virgin, she angered a spurned suitor which led to her martyrdom. Various legends suggest a grisly end, including the gouging out of her eyes. Hence she has become the patron saint of the blind, and many a painting show her holding a platter of unsettlingly staring eyes, looking vaguely like a pair of fried eggs. She’s quite right. Falling as it does during Advent, Saint Lucy’s Day is a big deal in all of Scandinavia, actually, a festival of light ushering in the Christmas season. 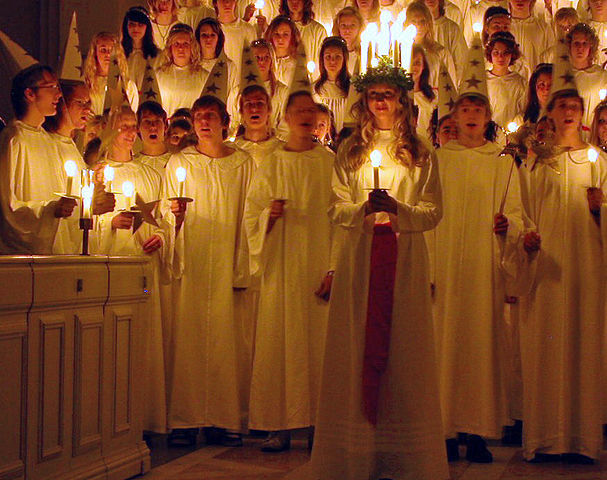 “Sankta Lucia” the song takes on lyrics in Sweden calling the saint a “bright illusion”–”Lucia” coming from “lux,” Latin for “light.” Processions of young people dressed in white robes are led by a representation of the saint, traditionally a young girl with a red sash around her robe and, like Saint Lucy, wearing a wreath and circle of white candles on her head. On the old Julian calendar Saint Lucy’s day used to fall on the winter solstice, so we’re pretty much back to Anchor’s feelings about trees as symbols of the earth set to be born anew. But if the label doesn’t turn you on after all that, there’s always the beer. One thing is for certain, that at 6.7% ABV, it’s the strongest Christmas Ale Anchor has ever produced, so that should light things up right there. That may account for a further dialing back of a spruce-like quality I detected in the beer for years. Now I’m guessing it comes mainly from cardamom, but who knows? It certainly doesn’t come from a tree; in a recent interview Ungermann said Anchor has never actually used any parts of the tree on the labels in the beers, but hinted that just such a thing might happen next year. I loved the 2016 version of the beer, and saved a bottle for comparison. 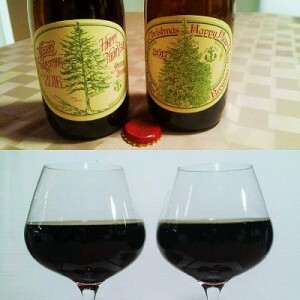 They look identical, but they’re quite different beers. I preferred the 2016, with its cherry, fruity quality and hint of smoke. But 2017 is fine, too, now so dark with a thick roasty head I think we can get away with calling it a spiced porter. I enjoyed it enough to plow through a six-pack and then run out to buy some more. I detected a whiff of red licorice in the nose, toasted bread, some chocolate, and my first impression was of such lively carbonation it was a little like putting a pincushion in my mouth, if that can be done in a pleasant way. There’s that mild touch of spruce, plenty of other mysterious spicing, just a hint of sour, some mild fusel notes and a long and lingering bittersweet chocolate finish. A satisfying mouthful. Try drinking some while humming “Santa Lucia” or wearing candles on your head and the day should be complete. TAP Beer(s) of the Week: Nice Cans!